Have you heard of rustic interiors? For sure you did. When you hear this, what immediately comes to your mind is the heavy use of wood in the space. It literally means that the wooden texture is retained which can be seen in almost everything in the interior. But not everyone likes this look, right? So if you are the type who wants a subtle rustic touch to your home, why don’t you combine it with some contemporary touches? It would totally look good. If you are not convinced about that, then you have to see this round up that we did today. 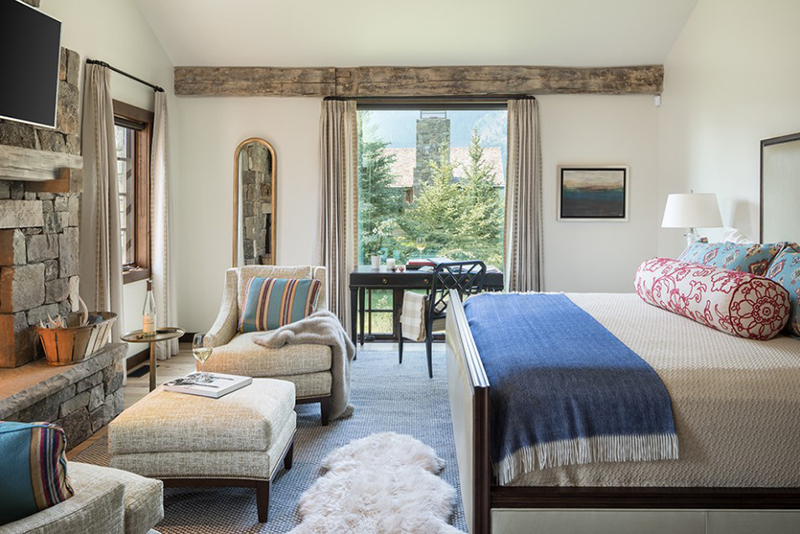 We looked for bedrooms that used both rustic and contemporary style in its interior. You will be surprised about how it turned out! 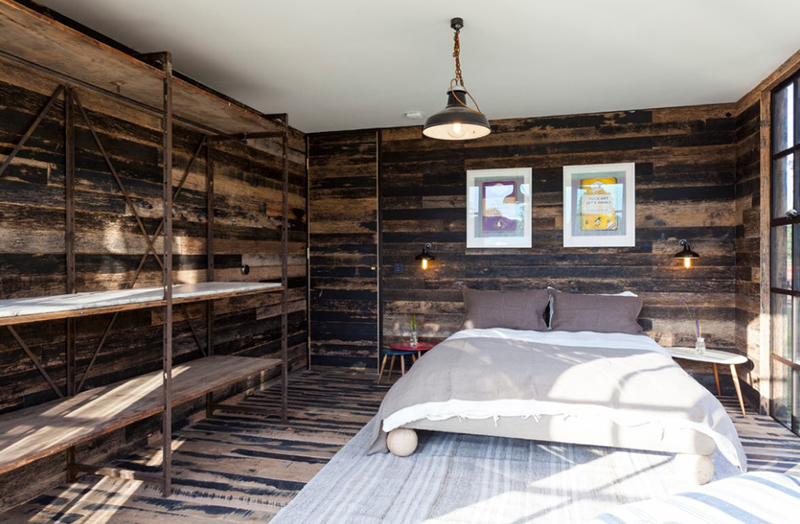 This is a beautiful rustic contemporary bedroom which has a stunning design. Everything here contributes to the appeal of the room including the canopy bedroom. 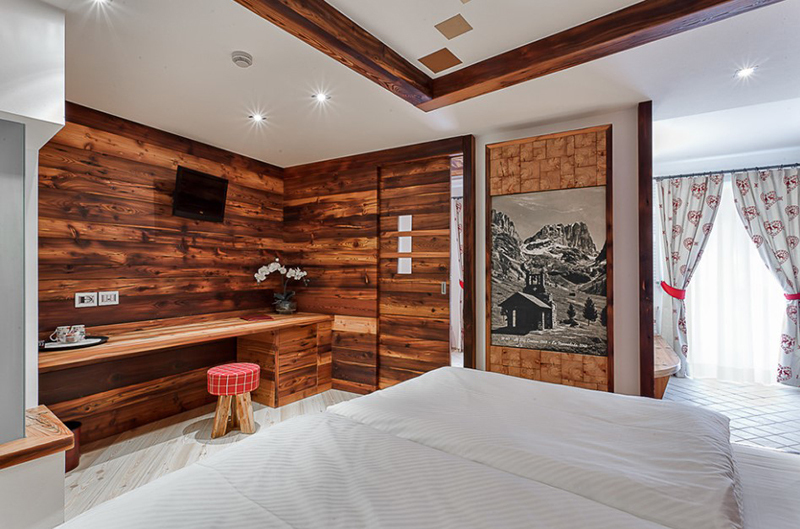 This bedroom has a wooden feature wall with a beautiful pattern. It also made used of a soft carpet which is a good contrast to the hard texture of wood. 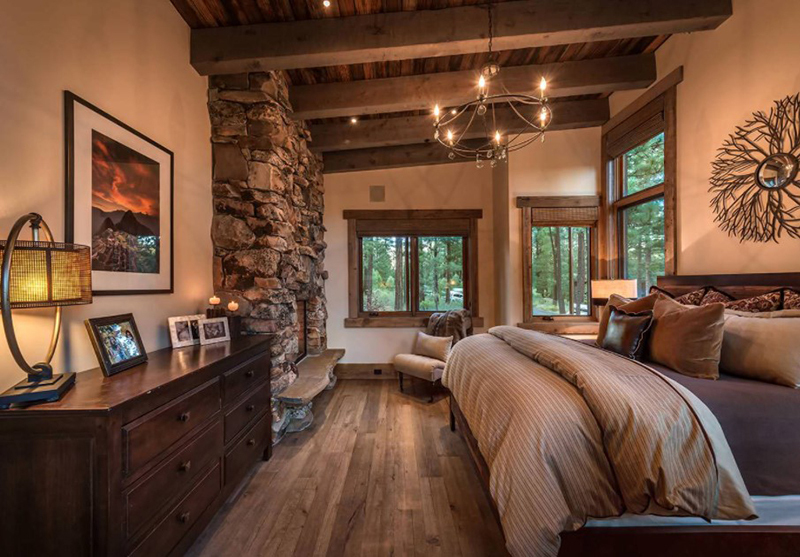 This bedroom offers a good view of the gardens and the trees outside which completes its rustic feel. What adds to the room’s rustic beauty is the stone fireplace. Contemporary furniture is used in the space. 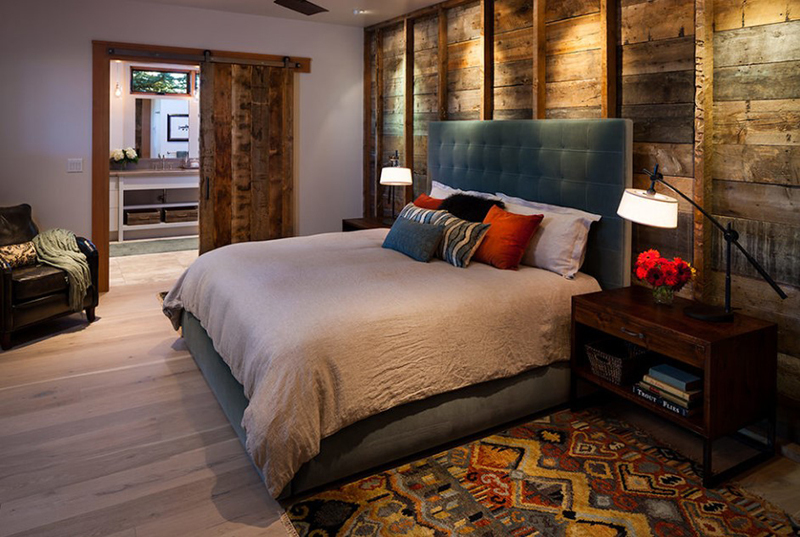 Instead of using wood for the walls and ceiling, this bedroom used wood for the barn door which also holds the mirror. There are two chairs too that mimics the color of wood. 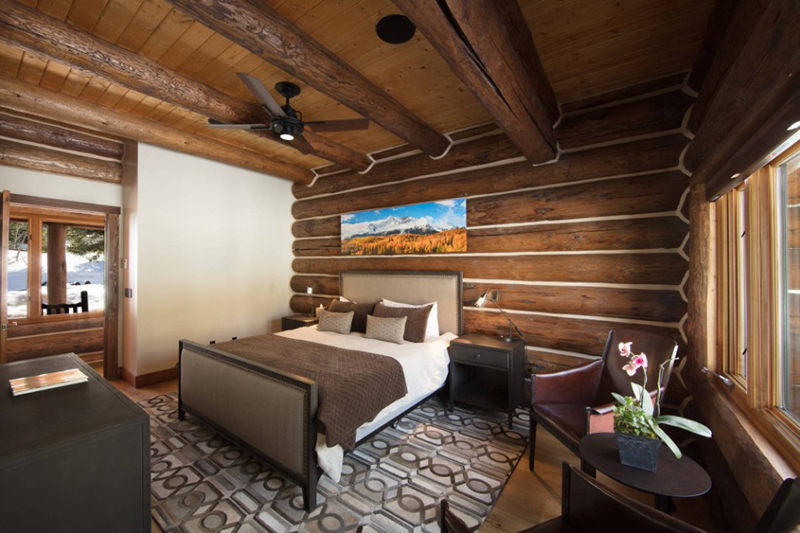 This bedroom used wood for the feature wall and the ceiling. A patterned area rug is added to the space which also has colors that compliment with the room. What is beautiful in this bedroom is how they integrated a bathroom into it. 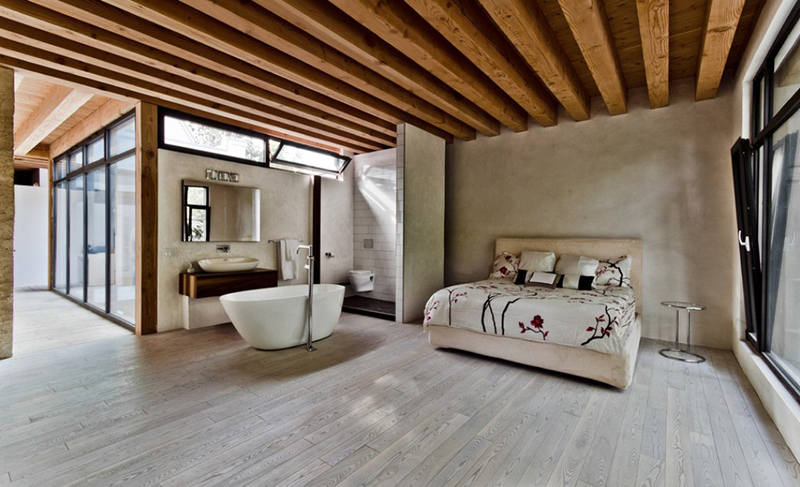 Unlike other bedrooms, this one has an exposed bathroom. There are also windows around it that made the space brighter. 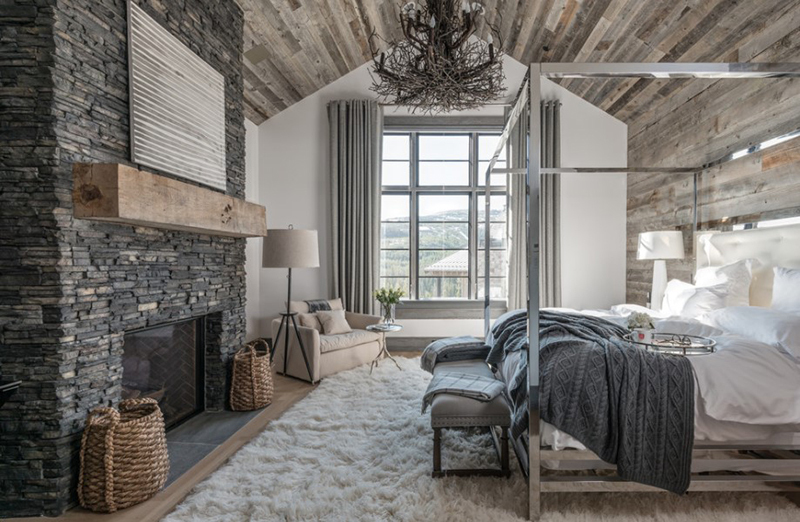 Aside from the stone walls and wooden ceiling, this bedroom also has rustic decors too like the rustic lights and the wall decor above the headboard. A small bedroom which has many natural elements in it like the fireplace surround and the bedroom furniture. Adding glass doors and windows into it allow natural light to get into the room. 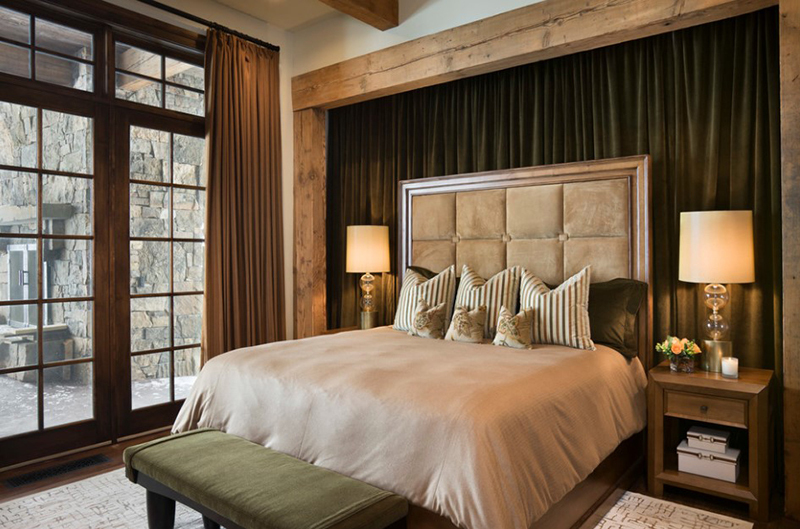 Although this one has a few wooden features which we can see on the bed, window frames, wall decor and door frames, the stone surround of the fireplace brings a rustic feel to the bedroom. At first look, we can see a western touch to this room with all the cowboy hats in it. it is just right to add wooden walls to this that completed the rustic look. 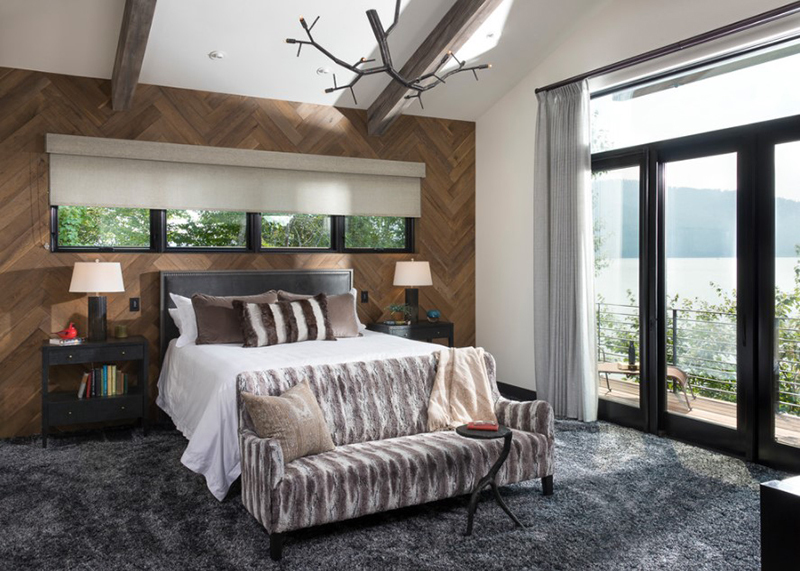 This contemporary bedroom added wooden elements in it which we can see in the ceiling and the area which holds the television. The beautiful view outdoors adds to the home’s beauty. 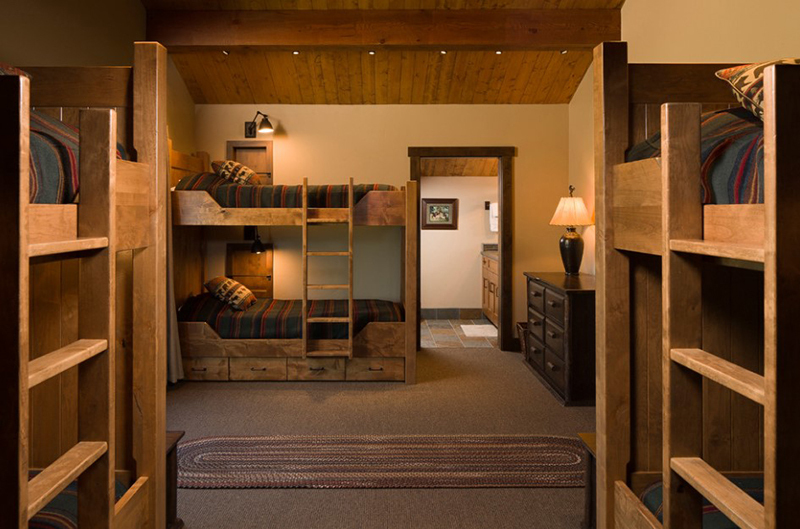 This rustic contemporary bedroom is obviously a room for many children! 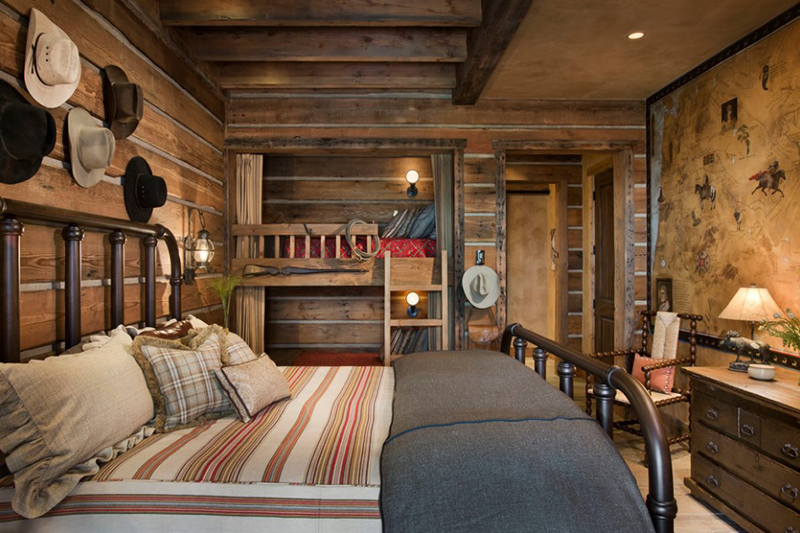 It has bunk beds in it which are made from wood and they brought a lovely mountain style to the bedroom. 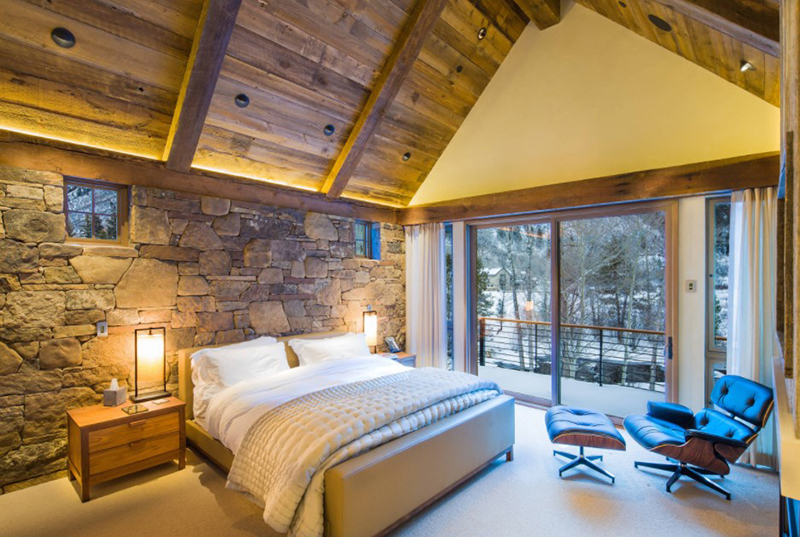 Natural wood is used for the column and beams of this bedroom. Obviously, these are added for appeal which matches its walls. It is also a good idea that they used white for the tall shelf and the bed. What makes this space rustic is it’s used of wood for the exposed beams and that area on the wall where green drapes are used to cover it. The brick walls outdoors, which can be seen from the bedroom, also adds that rustic appeal to the space. Although this bedroom is small, it looks totally awesome as it balances the use of wood and white in it. It also leads to a bathroom with white and red curtains. Notice also that it has a nice custom door and ceiling. Who wouldn’t love the wooden features here and the contemporary decors in it? Just look at that area rug and the colors used for the throw pillows. It is also a good idea to use light wood for the bunk bed. This one looks nice with a wooden barn door and rustic wooden walls. It used light wood flooring which looks good with the white walls. That printed area rug brings more life to the space. 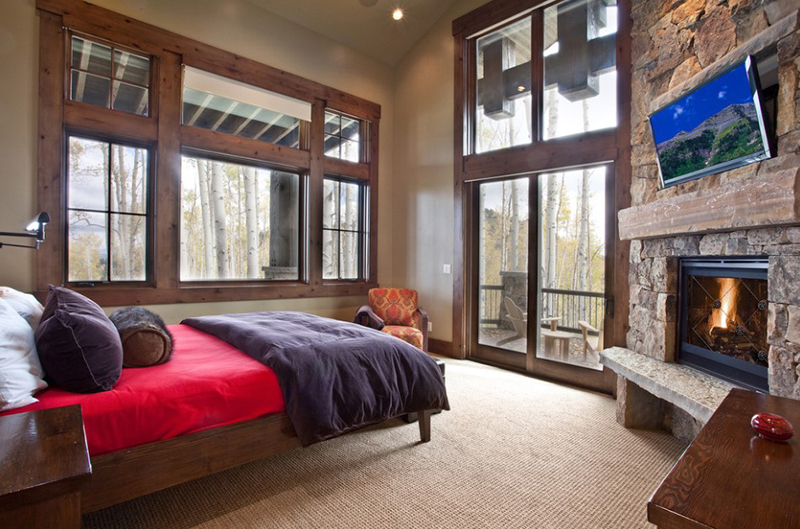 This bedroom has glass windows around it which brings natural light into the space. It also features a brick wall backdrop for the metal contemporary canopy bed. For this bedroom, it used wood for the walls, flooring and even for the open shelves for additional storage. They actually look like bunk beds to me but I’m not sure if it is sturdy enough to be a bed. 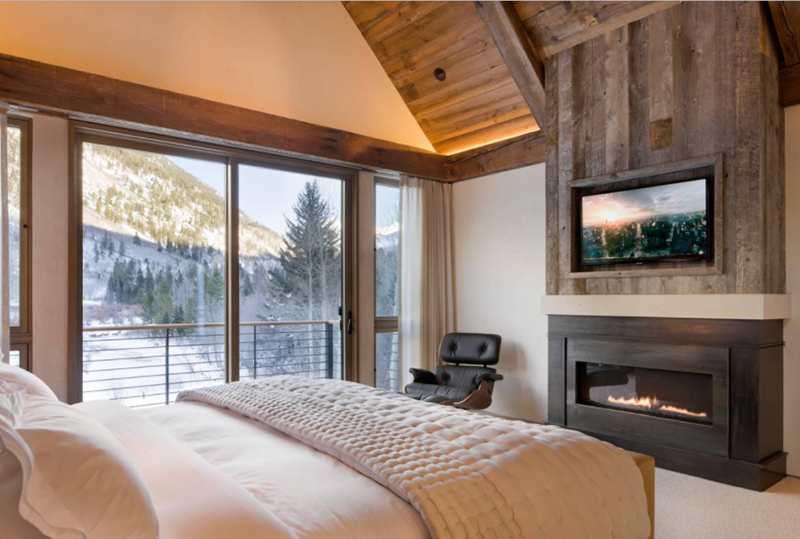 Isn’t it nice to combine rustic and contemporary styles for the bedroom? 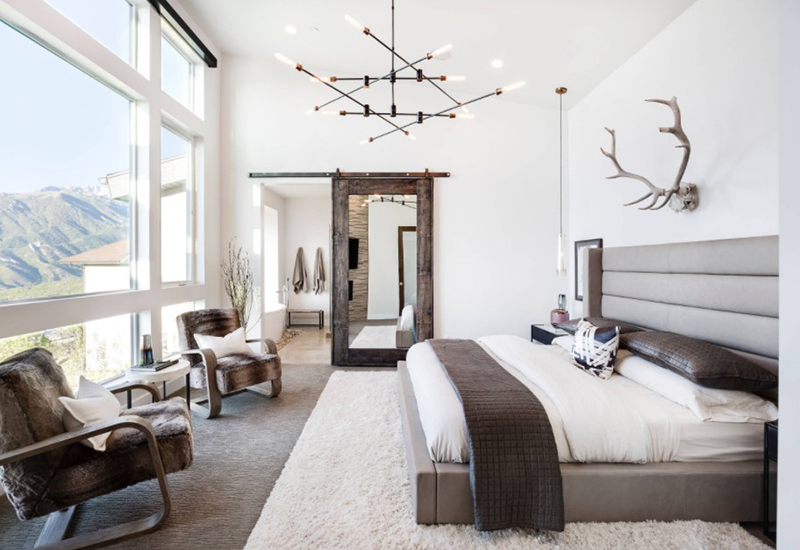 This is a good way to lessen the rustic features and it also gives the bedroom a cozier aura with the contemporary features in it. Of course, each of the bedrooms in the list above used wood in it. However, they are used in many different ways. You can either add wooden beams or use dark wood furniture in it. Of course, it is wise to balance the look by adding white in the room. 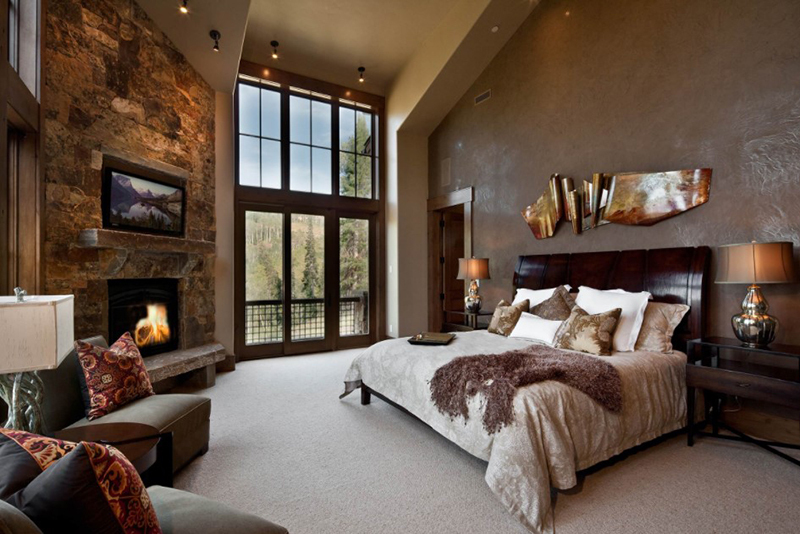 Do you think this type of bedroom will work well for your home?